Nothing short of trumpet fanfare could announce fall’s arrival more clearly than that colorful classic: the chrysanthemum. Bursting with blooms and earthy colors that mirror the landscape, mums steal the spotlight every fall. Originally cultivated in China, the hardy perennial comes in many varieties. 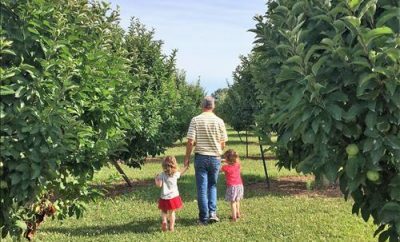 At Leider Greenhouses, the particularly resilient Belgian Padre proves a perennial favorite. Multitasking mums work well as potted plants to make a porch “pop.” They also create bold borders and freshen fading flower beds. With blooms that last for weeks – and bloom times you can stagger from mid-August through mid-October – mums make fall a feast for the eyes. 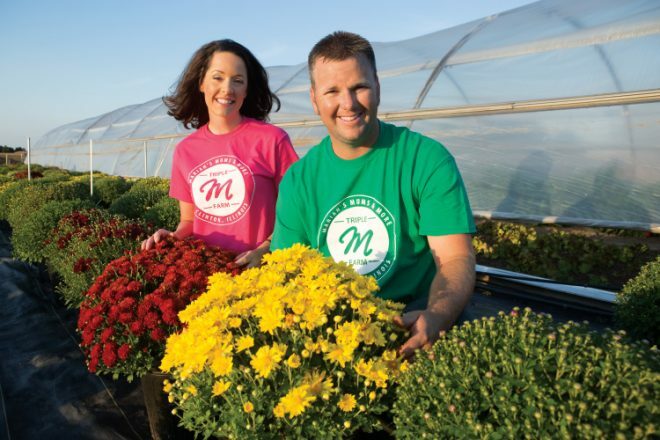 Though mums come in a variety of bloom types, Mariah Anderson, who owns Triple M Farm in Clinton with husband, Greg, says color drives most of her customers’ decisions. 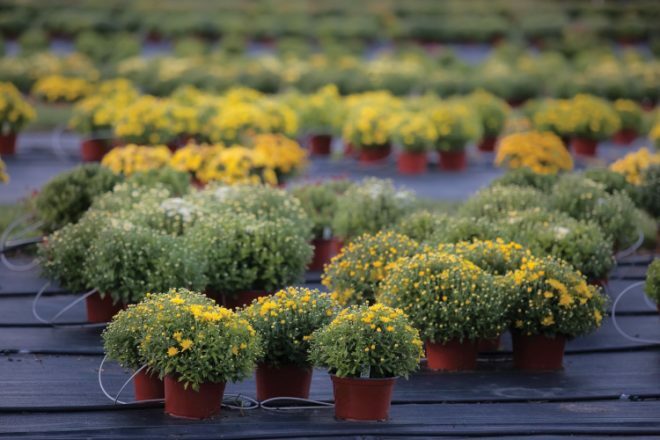 “We grow more than 100 varieties of hardy fall mums. Customers typically choose by color – and yellow is by far the most popular,” says Anderson. Even within a single color category, many variations exist. 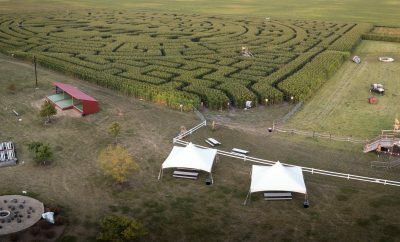 For example, the farm offers 30 varieties of mums in orange alone. 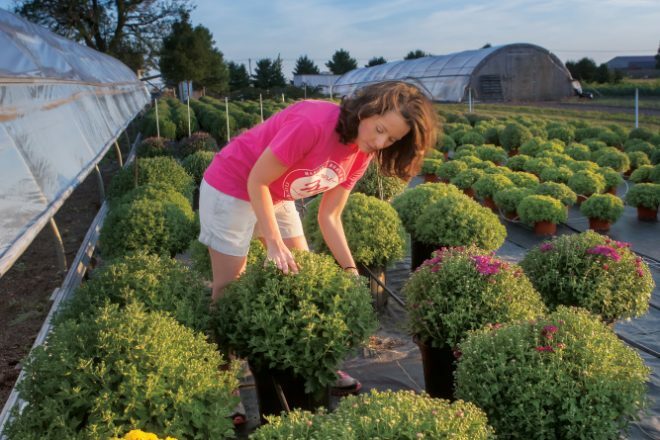 Along with the tried-and-true traditional colors, the farm prides itself on offering more than garden-variety mums. 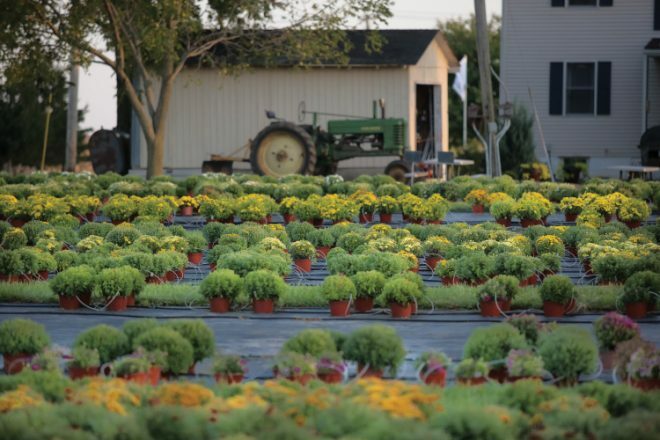 Savor the fall season with mums and more from these Illinois farmers. For example, their popular tricolor mums capture the spirit of the season with names such as Candy Corn, an orange-yellow-white combination, and Trick or Treat, a purple-yellow-orange trio. Whatever color strikes your fancy, be sure to plant mums in a sunny spot in well-drained soil. “They like full sun, and don’t like too much water,” says Anderson, who recommends caring for mums much as you would a rose. The National Chrysanthemum Society recommends watering about 1 inch a week early in the season and increasing the amount as plants grow and temperatures rise. Many buy this affordable perennial for use as an annual. However, if you would like your mums to return in the spring, plant them in a semiprotected area, fertilize once or twice a month and mulch after the first freeze. Prompt planting also helps your mums weather the winter. Pinching is an important practice for mums purchased in the spring. By creating more branches and blooms, pinching cultivates mums’ mound-like shape and ensures an abundant show of color when autumn arrives. Early in the season, the National Chrysanthemum Society recommends pinching or pruning about 1 inch from the top of each stem when plants reach about 6 inches tall – and again when the new growth reaches 6 inches. Pinching through July helps mums peak in the fall, just in time to fill the void left by summer’s fading blooms. Aside from their obvious charms, perhaps mums’ greatest appeal lies in the memories they evoke. Along with their power to spark a memory, mums help to soften summer’s end. “By the time fall arrives, a lot of the flowers people planted in spring and summer start to fade away. 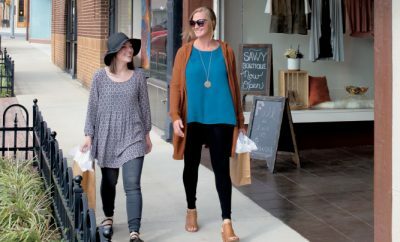 Fall mums offer something new to beautify the front porch and landscape,” says Anderson, who savors seeing her family’s homegrown mums brighten up other families’ gardens and porches.